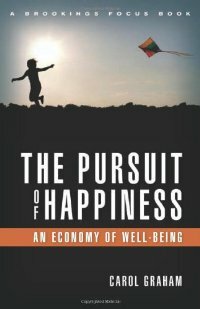 Carol Graham, "The Pursuit of Happiness: An Economy of Well-Being (Brookings Focus)"
In The Pursuit of Happiness, the latest addition to the Brookings FOCUS series, Carol Graham explores what we know about the determinants of happiness, across and within countries at different stages of development. She then takes a look at just what we can do with that new knowledge and clearly presents both the promise and the potential pitfalls of injecting the "economics of happiness" into public policymaking. This burgeoning field, largely a product of collaboration between economists and psychologists, is gaining great currency worldwide. One of a handful of pioneers to study this topic a mere decade ago, Graham is understandably excited about how far the concept has come and its possible utility in the future. The British, French, and Brazilian governments already have introduced happiness metrics into their benchmarks of national progress, and the U.S. government could follow suit. But "happiness" as a yardstick to help measure a nation's well-being is still a relatively new approach, and many questions remain unanswered. The Pursuit of Happiness spotlights the innovative contributions of happiness research to the dismal science. But it also raises a cautionary note about the issues that still need to be addressed before policymakers can make best use of them. An effective definition of well-being that goes beyond measuring income—the Gross National Product approach—could very well lead to improved understanding of poverty and economic welfare. But the question remains: how best to measure and quantify happiness? While scholars have developed rigorous measures of well-being that can be included in our statistics—as the British are already doing—to what degree should we use such metrics to shape and evaluate policy, particularly in assessing development outcomes? Graham considers a number of unanswered questions, such as whether policy should be more concerned with increasing day-to-day contentment or with providing greater opportunity to build a fulfilling life. Other issues include whether we care more about the happiness of today's citizens or that of future generations. Policies such as reducing our fiscal deficits or reforming our health care system, for example, typically require sacrificing current consumption and immediate well-being for better long-run outcomes. Another is whether policy should focus on reducing misery or raising general levels of well-being beyond their relatively high levels, in the same way that reducing poverty is only one choice among many objectives in our macroeconomic policy. Employing the new metrics without attention to these questions could produce mistakes that might undermine the long-term prospects for a truly meaningful economics of well-being. Despite this cautionary note, Graham points out that it is surely a positive development that some of our public attention is going to better understanding and enhancing the well-being of our citizens, rather than emphasizing the roots of their divide.